Do you ever feel like you have a magical cosmic connection with some people that you just can’t explain? For me, one of those people is my 8 year old niece Kaie, or Chickiepooh as I like to call her. I fell madly in love with her even before she was born and I had the pleasure of being my sister’s birth coach and one of the first to lay eyes on her. Just the other night I was telling hubby just how much I missed her and worrying that she’d forget all about me since I no longer live in Canada. Although we talk on skype regularly, it’s not the same and I miss having her in my life regularly, taking her places and cuddling with her. The next day I received an instant message from Mama asking if I could go on Skype because Chickiepooh had woken up in tears and was emotional about how much she missed me (and hubby) since she wouldn’t be seeing us this summer as she usually does. Call me silly, but I felt terribly guilty in that moment, almost like the universe had channelled my thoughts to her, triggering this emotional reaction. Her big brown eyes were glossy with tears, and her ultra curly hair a perfect little mess of bed head. “I miss you” she said. I reassured her that I missed her just as much and to lighten the mood I told her the story of how I used to dance my heart out to Whitney Houston’s “I Wanna Dance With Somebody” when I was about her age. I still recall those days when we had first immigrated from Lebanon to the USA (before moving on to settle in Canada) and how I used to watch MTV in admiration of Whitney Houston, Madonna and Cindy Lauper. We then watched the video together on YouTube and she proceeded to sing for the rest of our conversation, as she usually does. One of her many talents and hobbies. She’s quite a character, and unlike any other child I have ever met. We took her to the Aquarium in Genova two years ago and she’s declared herself a vegetarian ever since. She loves broccoli, quinoa, soba noodles, salad with balsamic vinaigrette, and kale and once refused the granola bars they were handing out at school, later telling her grandma “I read the label and they have too much sugar in them and that’s not good for me”. She’s beyond her years in many ways, but she’s still innocent and pure and a child, as she should be. She’s a potato chip monster and would eat and entire 1 kg bag in one sitting if left to her own devices, but sweets are not her cup of tea and she won’t come within two feet of anything that has a seed in it…due to a scare she had with a cherry pit once. Last I checked, she would refuse to sit at the dinning table in the presence of cherries or olives, even if they have been pitted. I couldn’t help but tell the story of Chickiepooh since she was all I could think about as I patiently pitted these cherries. 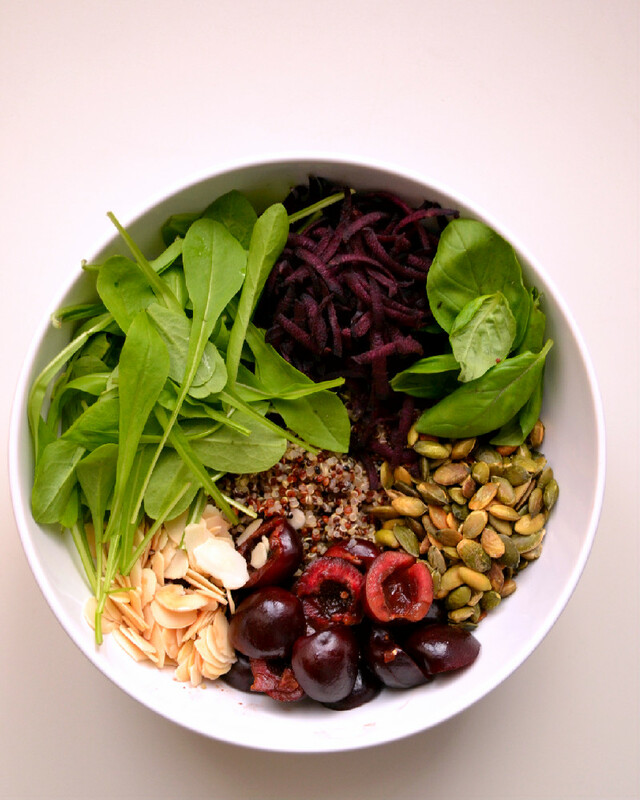 This salad packs a punch with nutrient dense quinoa, sweet dark cherries, toasted slivered almonds and pumpkin seeds, shredded purple carrots, radicchio novello and fresh basil. It’s simply seasoned with extra virgin olive oil and a balsamic cream allowing the natural sweetness of the cherries and the freshness of the basil to shine through. Radicchio Novello, if you’re unfamiliar with it, is Mini Crown Radicchio. 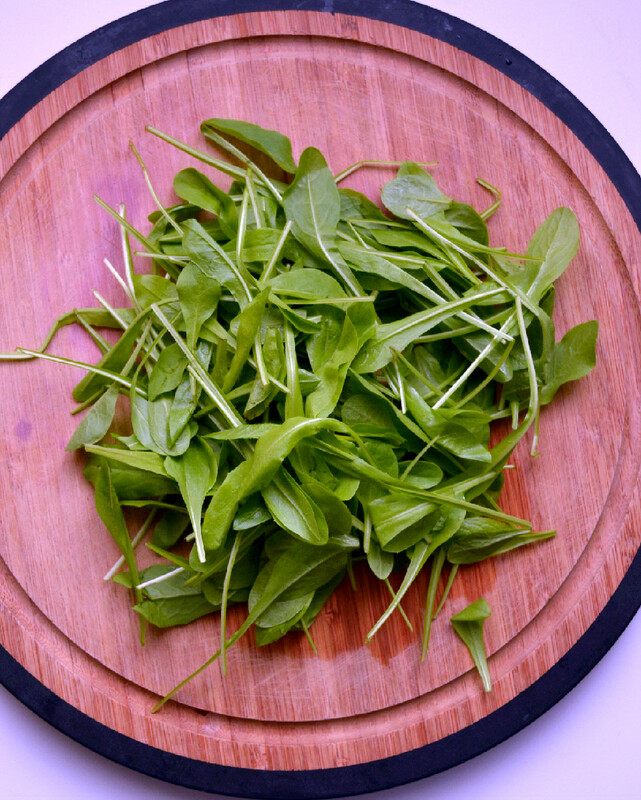 Unlike its purple counterpart, it’s a dark leafy green, and looks like a cross between arugula and baby spinach. It has a mild flavour and works wonderfully in salads and smoothies. It’s common to find here in Italy, but if you can’t find it where you are you can sub in baby spinach. As for the Balsamic Cream. it’s really not a cream at all in that it doesn’t contain dairy or non dairy creamer. 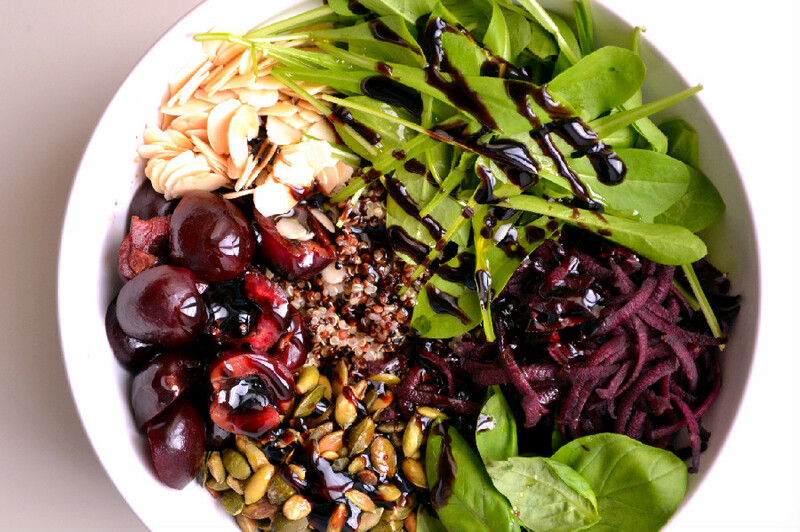 It’s made from balsamic vinegar and grape juice which have been reduced to a syrupy consistency. If you can’t find it where you live, you could always order it online or make your own using balsamic vinegar and a liquid sweetener. Just remember that a good quality balsamic cream shouldn’t have any added sugar. This salad comes together easily and makes a great light yet satisfying main course or an impressive dinner party side salad. Cook the quinoa according to these directions here. Measure out 1 1/2 cups, set aside in a large mixing bowl and let cool at room temperature. 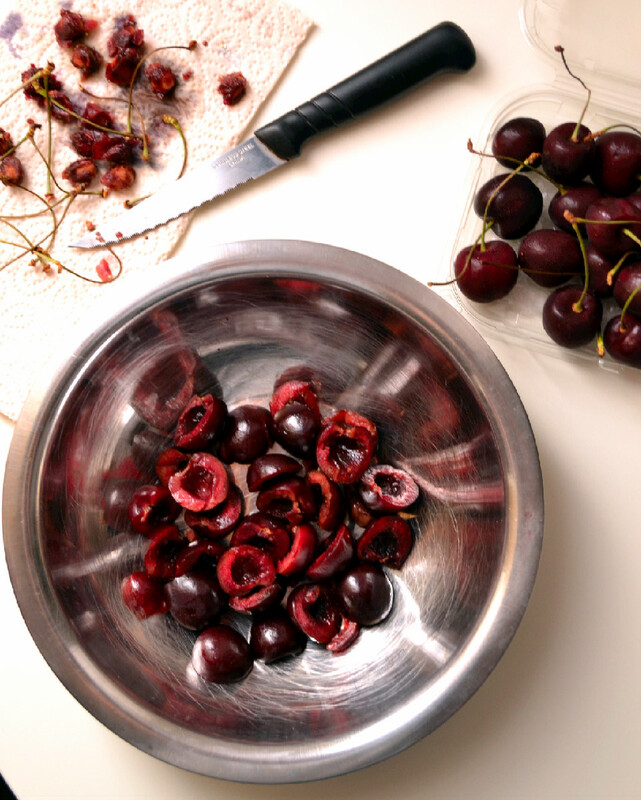 Pit the cherries, slice them in half and set aside. Dry toast the almonds and pumpkin seeds, separately, in a small pan over medium heat until slightly browned being careful not to burn them. Set aside. Rinse and pat dry the radicchio Novello and basil leaves. You don’t want them wilted, so be sure to rinse them gently. 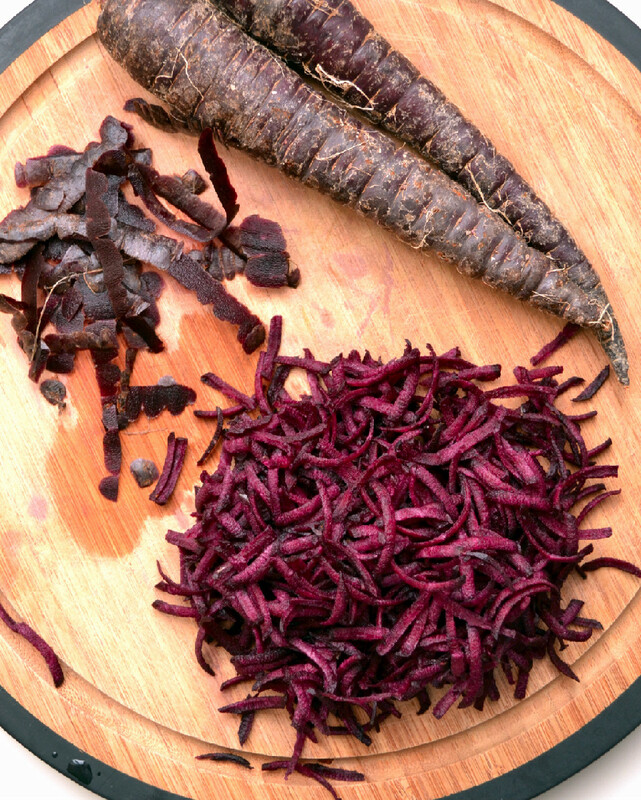 Using a microplane grater or julienne peeler, shred the purple carrot. 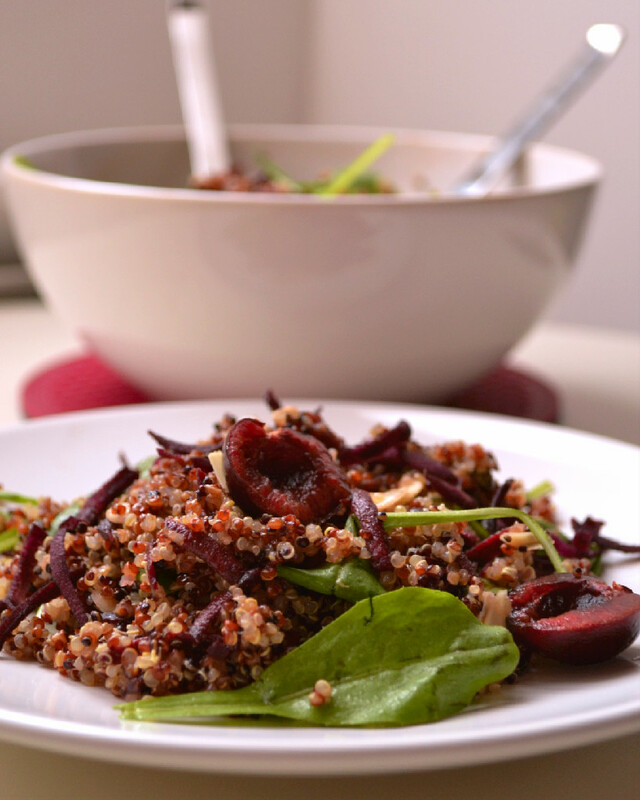 Once all the ingredients are prepared, add them to the quinoa in the mixing bowl. Drizzle with extra virgin olive oil and balsamic cream and toss to combine. Serve as a main course salad for two, or a side salad for four.